A leader of the Rum Rebellion of 1808 in Sydney was Anthony Fenn Kemp 1773-1868 father-in-law of Samuel Barrow. 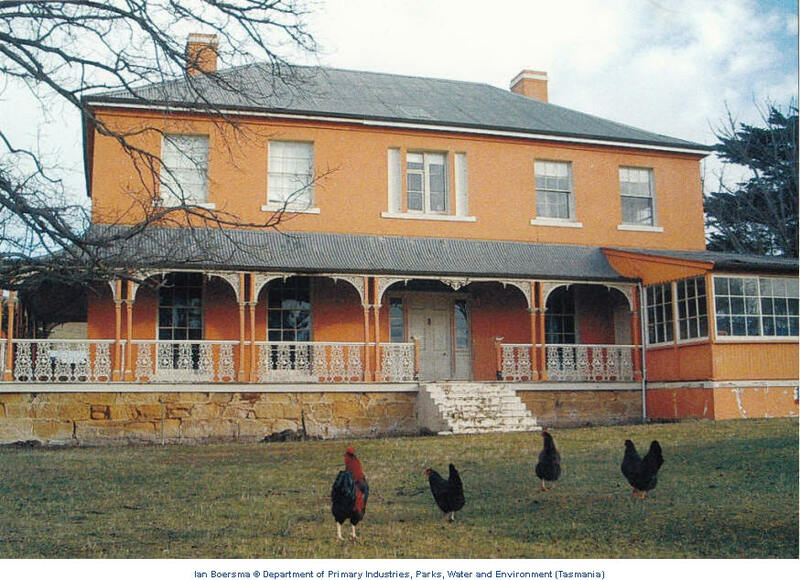 He later lived in Hobart, and once the local aborigines were defeated and bushranger activity died down, he retired to the above house in the early-1830s. Kemp named the house Mount Vernon (see below) and it retains that name today. It is in Melton Mowbray, Tasmania. Parts of the original building survive in the kitchen area at the rear. An earlier image from ref 46 p116 probably taken around 1930. Kemp, 'father of Tasmania', was a reckless bankrupt as a young man, and detested his meticulous wine-merchant father. Kemp visited France in 1791 during early revolutionary times, and visited George Washington in 1792 at Charleston in South Carolina. 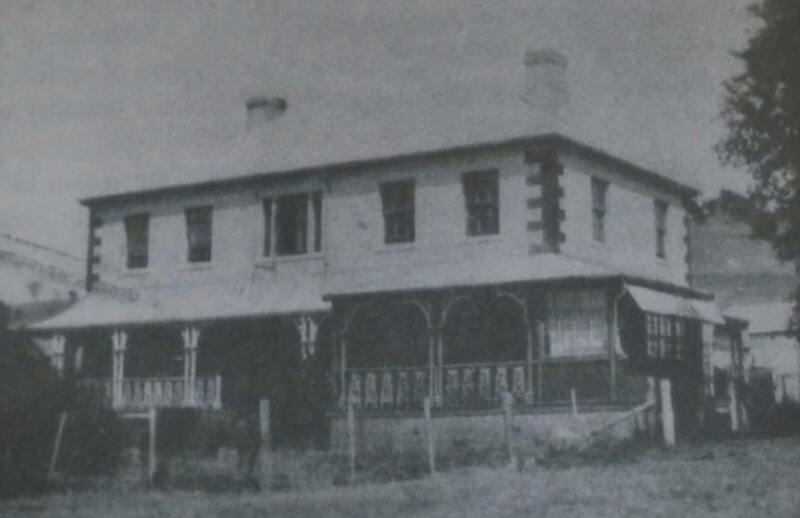 His father probably helped him buy a commission - in the NSW Corps - which became known as the Rum Corps after Kemp's practice as Paymaster of paying only in the form of liquor. After a period during 1804-5 in the north of the Tasmania (then Van Diemen's Land) establishing York Town, Kemp returned to Sydney where he became a leader of the Rum Rebellion in Sydney in 1808 which deposed the newly-arrived Governor Bligh. He gave evidence in London at the 1810 court-martial of the Corps' acting leader Major Johnston and for his candour Kemp was himself only lightly punished. In 1816, after his 3rd voyage to Australia, Kemp arrived in Hobart, and in the years 1817-23 in Hobart successfully campaigned for the removal of Lieutenant-Governor Sorell. Kemp's campaigns against Bligh and Sorell were not because of revolutionary ardour; rather Kemp had few scruples when it came to making money and protecting his commercial activities! Some argue that in Bligh's case there were broader issues in play than reining in the excesses of the Rum Corps - had the NSW colony a future only as a convict settlement? - but this broader issue was in large part merely an extension of Kemp's own commercial ambition. In Hobart, Sorell was quick to resist Kemp's misuse of his magistrate's office for personal gain. With colossal gall, once Sorell was recalled by George 4 in 1823, Kemp led a petition for reinstatement, too late to be effective of course. Sorell, a decent and popular man, later inexplicably became an in-law in that William Sorell who moved to Hobart and became a bureaucrat married Elizabeth Kemp in 1825 and thus Kemp's descendants include Aldous and Julian Huxley - through the 1850 marriage of his granddaughter Julia Sorell to Thomas Arnold (of the well-known English literary Arnold family). Curiously, after 13 years of marriage Elizabeth eloped to India, leaving Julia and 4 siblings with Sorell senior in Brussels, and India was where her younger widowed sister Margaret Louisa Barrow nee Kemp lived a second married life also leaving behind her 5 children - with the Barrows in Ryde. One of the few authority figures Kemp respected and indeed revered was George Washington whose house Mount Vernon - and hence the one shown above - was named (see ref 172 page 171) after Admiral Edward Vernon - known as Old Grog - who in the 1740s introduced the rum ration into the British Navy! Kemp's commercial success in Sydney and Hobart drew heavily upon liqour derived from his father's London business.